Celebrate the life of one of America's most beloved Presidents! George H.W. 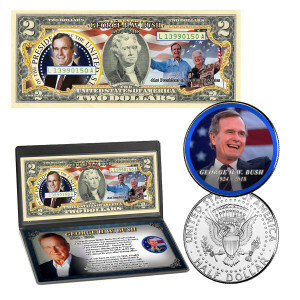 Bush is featured on a 2018 Kennedy Half Dollar and a genuine colorized U.S. $2 bills that were issued by the U.S. Treasury and which are U.S. legal tender. Each colorized coin and $2 bill is a true piece of history that will serve as a homage to First Lady and First Mother for generations to come. Like all such items, they will not be around for long and will surely become even more prized in future years. The colorizing is the highest quality in the world and is accomplished through a revolutionary, patented technique. The colors are life-like. 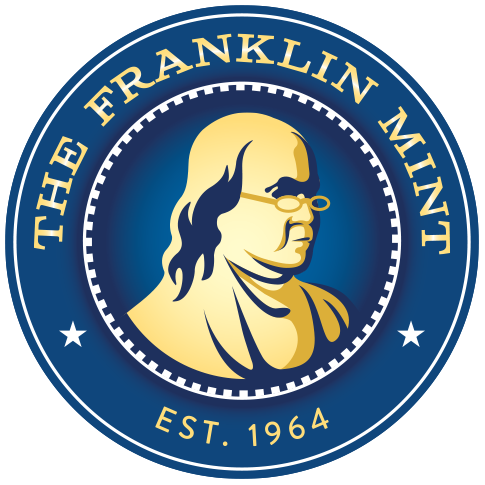 This coin is not available from the U.S. Mint. They are genuine Half Dollars that are struck by the U.S. Mint, but the Mint does not have the capacity to colorize coins. George H.W. Bush was the 41st President of the United States and served as vice president under Ronald Reagan. He was also the father of George W. Bush, the 43rd President. Born on June 12, 1924, in Milton, Massachusetts, George H.W. Bush fought in WWII and was elected to the U.S. House of Representatives in 1966. He served as Ronald Reagan's vice president for two terms and then won the 1988 U.S. presidential race, before losing his bid for a second term to Bill Clinton. Afterward, he made appearances for son George W. Bush, who also was elected U.S. president, and co-founded the Bush-Clinton Katrina Fund. Dimensions: 9" x 4.5" x 1"